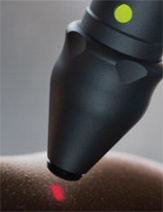 What Is Laser Therapy And How Can It Help Me? Laser therapy is merely the introduction of specific wavelengths of collimated light into damaged muscle tissue. This initiates a series of healing responses that will lower inflammation, decrease pain and often reduce down time needed for the healing process to occur. This is a pain free form of treatment.